The French were notorious for bringing the spoils of wars from all their escapades. And today one of those trophies, the French window, stands tall in our homes or apartments, breathing light, shedding a view that would have otherwise been a different view of things. The History of the French window. The French window is the result of a cultural appropriation that came into being after centuries of Italian Wars. More often than not, returning home as the victors from the wars, the French brought with them Renaissance design and architecture. The French window was also brought home as one of the spoils of the war and for which the French gave a twist of their own. The Renaissance architects worked on bringing symmetry, proportion, geometry and regularity into the Roman architecture and by also including Greek features, such as lintels, arches, columns and hemispherical domes while distancing themselves away from the gothic era architecture. By the High Renaissance period, the already high and rectangular windows of the Renaissance era had evolved into a floor – to – ceiling Palladian window flanked by sidelights and fanlights. This form of classical architecture that drew its inspiration from nature caught the imagination of the French who improvised it by adding window panes/ lights into mullion structures. 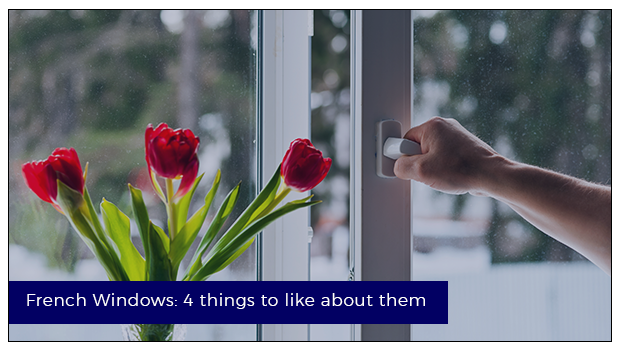 The mesmerizing ability of French windows to bring light into a room while providing easy access to the balcony areas, coupled with their classic proportioning has made them a viable and favourite option across the world. Over time, French windows have evolved into internal doors, owing to their ability to maintain light flow and also to light up areas of rooms that would have been previously impossible. The French windows are actually much narrower and more elegant than the wider products that are sold across universally as French doors. French windows open outward together, without the mullion that separates them, thereby creating the illusion of the exterior view being part of the interior design. Usually placed alongside as pairs in multiples across the walls of a large room, they maximise the outward view as part of the design. Even though French windows are made and used with aluminium, plastic and a variety of other materials across the world, nothing can simply replicate the classic charm, authenticity, tradition, and heritage of one that is made with wood. French windows are perfect for cozy winter days. You can easily bring the outdoors inside with such a door. Since French windows are primarily all glass, these types of windows can bring in an incredible amount of natural light. They not only offer an increasing level of security but also improve energy efficiency. The primary function of a French window is its beautiful features that can create a powerful impact on your home. French windows, be part of a legacy. More than ever, we face an acute shortage of space, light, and air in our homes. French windows are the idealistic option for the modern day man which provides him/her with the much-needed lighting and also with the charm and grandiose of the bygone era. Apart from the French windows, other types of windows such as sliding, casement, arch, or combination windows also come with multiple benefits and solutions that will equally complement your home’s overall design, depending on the requirement of your building and construction needs. In case you are looking for sliding, casement, arch or combination windows, Venster is the right choice for you.